The gall of Kaltenbachiella pallida on elm is closed, more-or-less globular and covered in short fine hairs (see first picture below). It arises from the mid-rib of the upper surface of the leaf near its base (cf. 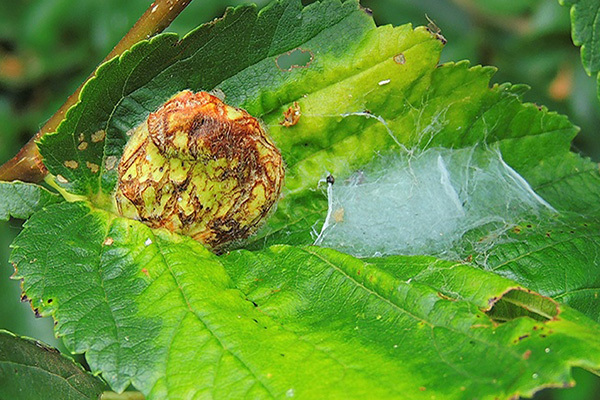 Eriosoma lanuginosum which has a similarly hairy gall, but most or all of the leaf forms a green or reddish-tinged large bladder; also Eriosoma lanuginosum galls are usually in clusters, arising at ends of twigs). 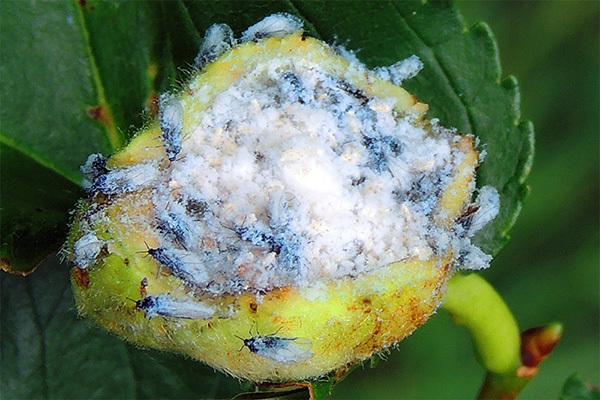 Immature aphids developing in the gall are pale orange yellow. 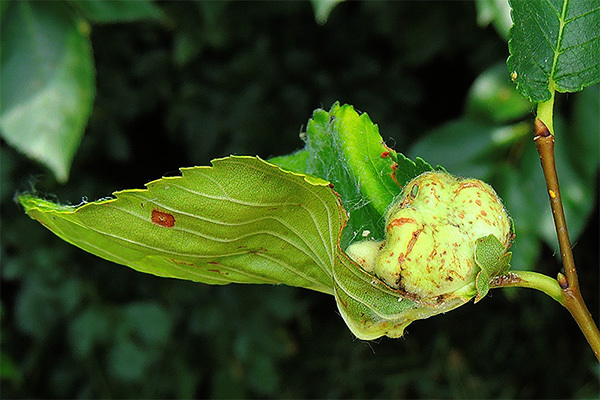 The winged adults that emerge from the gall in early summer (see second picture below) have the forewing medial vein usually unbranched, sometimes once-branched. The body length of alate Kaltenbachiella pallida is 1.8-2.1 mm. The alatae migrate in summer to the roots of members of the mint family (Lamiaceae). 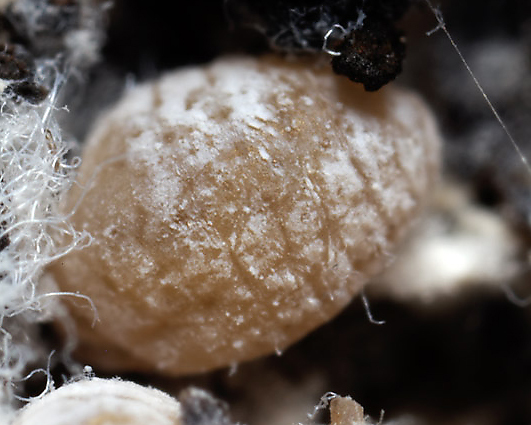 Colonies of very small yellow-white Kaltenbachiella pallida, with a body length of 0.9-1.3 mm, develop on the roots among flocculent masses of white wax. Alatae appear in late-summmer to early-autumn and migrate back to elm, where eventually overwintering eggs are laid. Kaltenbachiella pallida occurs in Britain, throughout continental Europe and in north Africa, the Middle East, south-west and central Asia, west Siberia, China, and is reported also from Argentina. The gall of Kaltenbachiella pallida is shown below. Image above copyright Dr László Érsek, all rights reserved. 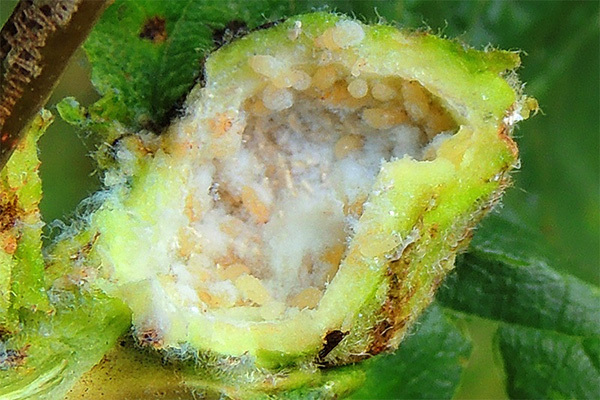 Immature aphids in the gall (see first picture below) are pale orange yellow. After one or two generations in the gall, these develop to alatae. The alatae migrate in summer to the roots of mint (Mentha), marjoram (Origanum vulgare), thyme (Thymus) and woundwort (Stachys). 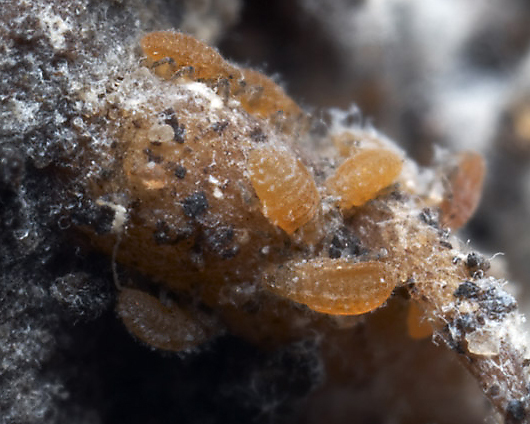 These give rise to colonies of very small orange apterous aphids on the roots which are covered with flocculent masses of white wax (see two pictures below). Images above copyright Sharon Reid, all rights reserved. In late-summmer to early-autumn alatae appear and migrate to elm. Presumably gynoparae return first and produce oviparae, which then mate with winged males produced on the summer host - but we have been unable to find any information on this in the literature. Eventually overwintering eggs are laid. Kaltenbachiella pallida has been recorded from 6 Ulmus species (Ulmus ×elegantissima, Ulmus glabra, Ulmus laevis, Ulmus minor, Ulmus procera, Ulmus pumila). Blackman & Eastop list about 75 species of aphids as feeding on elms worldwide, and provides formal identification keys for aphids on Ulmus. Most of the aphids are in five genera: Colopha, Tinocallis, Eriosoma, Kaltenbachiella, and Tetroneura. We especially thank Dr László Érsek, and Dr Sharon Reid (fera), for the images shown above.